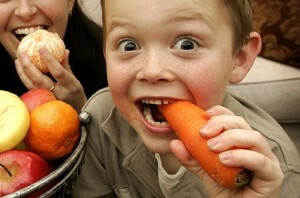 children generally have a healthy attitude about food and seem to be eating well. The not-so-good news is that obesity is emerging as a problem, likely because they are starving for exercise. On the plus side, eating is among children’s favourite activities. Kids give themselves good marks when asked to evaluate their eating habits, but have some trouble seeing the bigger nutrition picture. Like many of the adults whose views they mirror, they tend to label foods as « good » or « bad ». Fruits, vegetables and milk score high marks as healthy, or « good » foods. Children enjoy foods like chocolate and chips that are not part of the four food groups, but label them as « bad » foods. This polarized view makes it difficult for them to truly evaluate their total eating pattern. What’s more, grains are overlooked as an important part of healthy eating. Parents have the greatest influence on what kids eat. To reinforce balance, variety and moderation, they can help their children think of foods as being « everyday » and « sometimes » foods. The everyday foods are found in the four food groups; the sometimes foods are treats like chocolate, chips and pop — to be enjoyed occasionally. Because many children spend at least some time home alone, parents should provide tasty, nutritious snacks that are accessible, such as oatmeal cookies, crunchy cereals, yoghurt or fruit. TV advertising, another influence on children, can be turned into a learning experience by helping children think about how the ads they see influence their view of a product. Nutrition data on children are scarce, highlighting the importance of a recent survey related to Ontario’s Better Beginnings, Better Futures program. It suggests that children from low-income Ontario families are starving mainly for exercise. Despite low energy intakes, many of the children were obese. School-age children were less active than preschoolers, suggesting that when days are spent in school, activity patterns change for the worse. Furthermore, although most nutrients were adequate, calcium intake seemed low among the school-age children. These findings are disturbing because excess weight and low bone density cause serious health problems in the long term, » says Hendricks. « It is time for people to merge nutrition and fitness together in their minds as inseparable parts of a healthy lifestyle equation. The environment in which children grow up has an important influence on their lifelong habits. Parents should demand that schools not only teach children about nutrition in the classroom, but also commit to health policies that make healthy eating and daily physical activity an integral part of the school environment. Communities across the country are responding to address local issues. Such programs can build children’s self-esteem while improving their nutritional health and fitness, by developing their skills and recognizing their achievements, explains Doris Gillis, the nutrition consultant who conducted the review.